Introducing – the world’s first truly compact ‘Patio Green Gage’ – now you can pick delicious crops of full sized fruits for decades to come, right from your patio or balcony! If you have ever tasted old-fashioned greengage fruits, which the French call ‘Reine-Claudes’, you will know how wonderfully tasty and juicy they are. In fact, some would say they are the tastiest fruits you can produce! Available now for the first time in specially developed compact ‘Patio’ form you can grow them as the perfect patio fruit tree for smaller gardens that can be accommodated in as little as 3ft x 3ft! Developed by renowned British fruit grower and ‘Grafter’ William Sibley, this is the marriage of the perfect dwarfing rootstock which ensures it never exceeds 4ft tall, with the truly scrumptious ‘Reine-Claude’ fruits!. 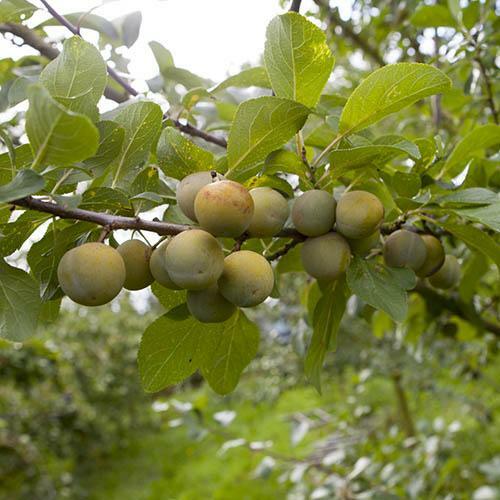 Their sweet late-summer fruits are some of the most delicious you can grow - looking like an unripe plum perhaps, they are packed with an intense flavour not found in regular plum varieties. They are so well loved in gastronomic France, the arrival of the first picked fruits is a reason for celebration in many parts of the country! Best eaten fresh in our opinion, you can also cook with them to make great flavour-packed jellies, tarts, jams, and sauces. As garden trees, they are very good ‘doers’, meaning they are no-nonsense great performers…. They have the most beautiful spring blossom to kick off the year. A very hardy tree indeed, and partially self-fertile, you can increase crops by growing near peaches and nectarines, or using an artist's paintbrush from flower to flower when in blossom. You might get limited fruit in the year of receipt, but should expect bumper-crops in the second or third season after planting. This little beauty is destined to stay small, so works well in a big pot on the patio or terrace. The variety has been grafted onto a very dwarfing rootstock that was discovered by William Sibley in the former Soviet Union!! Grab yours while it’s still in stock! Supplied as a grafted tree in a 2L pot, about 60cm tall. Dormant in Winter.